There are changes to the referees appointed to the two Sevens Series in 2018-19, especially to the Women's Panel. Altogether, 25 referees have been named - 12 for the 10 Men's tournaments, 13 for the six Women's tournaments. The first men's tournament is in Dubai, starting on 30 November 2018, and the last in Paris on the first weekend of June 2019. The first Women's tournament is in Glenvale, Colorado on 20 October 2018, the last in Paris on the first weekend in June 2019. Three referees who were on the last tournament are not on the new panel - Mike O'Brien (USA), Nori Hashimoto (Japan) and Tevita Rokovereni (Fiji), who has been switched to the Women's Series. Six referees from the last series are not on the new panel - Alhambra Nievas (Spain), Ben Crouse (South Africa), Aimee Barrett-Theron (South Africa), Rebecca Mahoney (New Zealand), Sakurako Kawasaki (Japan) and Rose LaBrèche (Canada). They include Alhambra Nievas who refereed the women's final at the Rio Olympics and received the referee of the year award jointly with Rasta Rasivhenge. Apparently she and Ben Crouse have retired. The five newcomers are Tyler Miller, Emily Hsieh, Ashleigh Murray, Lauren Jenner, and Madeline Putz, who played for Australia for four seasons before turning to refereeing. Not yet 30, she was a remarkably speedy wing. 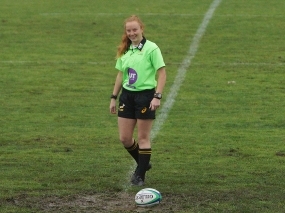 Ashleigh Murray, a member of the Golden Lions Referees' Society has been making a rapid rise through refereeing ranks. Last year she refereed at the women's qualifying tournament at the Hong Kong Sevens, and her promotion has followed on from her performance.